The Chronophage is one of the things I’m most proud of. ‘Chronophage’ is derived from the Ancient Greek words ‘chronos’ and ‘phage’, meaning ‘time-eater’. The creatures that stalk the top of the clocks will continue to eat time for hundreds of years to come, so the majority of the construction is in stainless steel, gold and enamel, chosen for their longevity. When I returned to Cambridge in 1999, I found the undergraduate library was unchanged since I was a student in 1956. I decided to offer my former college – Corpus Christi – sufficient funds to transform the adjacent bank into a new library. 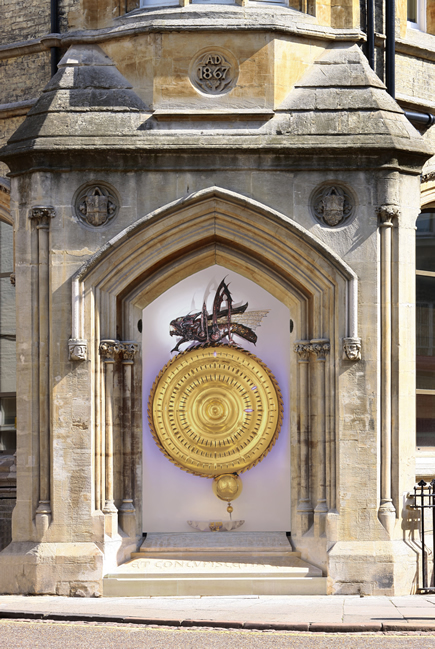 The Corpus Chronophage was created to occupy the old bank’s front door. We designed the Corpus Chronophage using materials that would last for hundreds of years. The main body is made of stainless steel and gold, both of which will last for a long, long time. What inspired me to produce the Chronophage? Modern art. The majority of modern art is superficial, there’s nothing to it. I was inspired to create the Chronophage because of modern art. I’ve never been a fan of it, so I wanted to create something that was modern art but had a bit more to it. I wanted to find a new way of telling time. My idea with the Chronophage was to turn the clock inside out, and then make the tiny little escapement and the grasshopper into the biggest gear on the clock. I wanted impact so I made it one and half metres in diameter, with the grasshopper a metre long on the top and its legs were the pallets of the escapement which John Harrison designed. This means you can actually see the grasshopper escapement working. I tasked myself with creating modern art that actually does something – in this case, a clock that entertains and interacts with the viewer. Although it is an extremely accurate timepiece, the Chronophage is designed to demonstrate the relativity of time. When Albert Einstein tired of explaining his theory of relativity, he would tell people, ‘When you sit on a park bench with a pretty girl for an hour, it seems like a minute; but if you sit on a hot stove for a minute it seems like an hour: that’s relativity’. The Chronophage Clock’s pendulum slows down, speeds up and even stops, with the time shown by lights racing around the face. The time is exactly correct every fifth minute to one hundredth of a second. I don’t like to do anything that’s been done before, so it was necessary to find a new way of telling the time. Time is not on your side, it’s rather scary, so with the Corpus Chronophage I changed the cuddly image of a Walt Disney grasshopper into a rather frightening time eater. I thought it would be fun if in a minute he slowly opened his jaws wider and wider, and on the 59th second of every minute he went crunch, got that minute, chewed it up and swallowed it so you could never get it back. Since then I’ve designed the Midsummer Chronophage and the Dragon Chronophage. It’s been fascinating too to accept a private commission which is now on display at The Houston Museum of Natural Science.